We officially have had people working in our house for a full two months. As you know, we are not yet living there. It’s an ideal situation, in some regards. We don’t have to be without the ability to cook. We don’t have to move our stuff out of the way. And when we want to get away from the action, we can head back to the apartment. There are definite advantages to not living in a remodel zone. But! 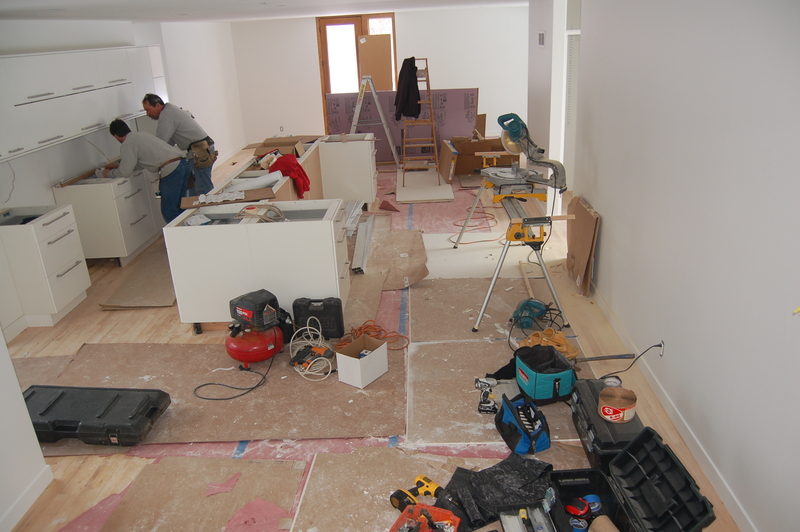 There is a major disadvantage to living off-site: The house becomes merely a work-zone. Void of all possessions and other signs of people living there, it is treated with a sort of disrespect that isn’t intentional, but apparent. In recent days, I have been frustrated by the mess upon more mess. I was okay with it before the brand new things started to get installed. 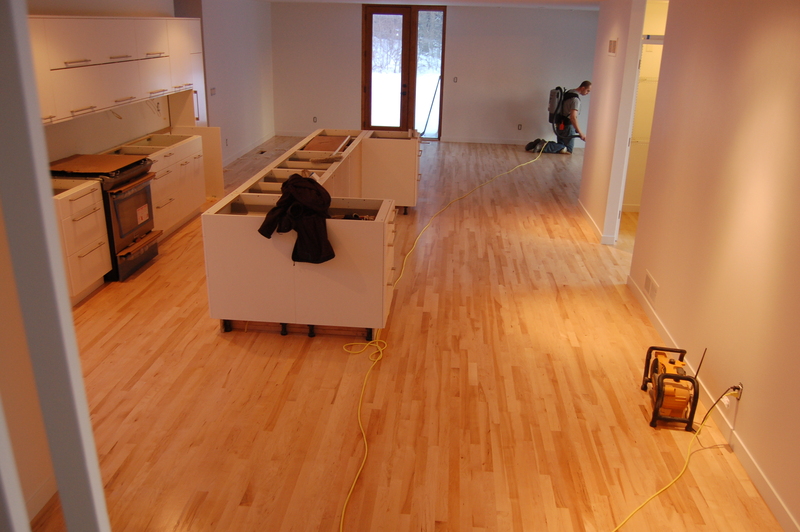 But, now we have a new wood floor, fresh painted walls, cabinetry, and new carpeting upstairs. I feel like no one has noticed, and the dust continues to fly! Last night I was at the house shop-vacing like a maniac, a bit horrified to find vast amounts of wood scraps, sawdust, and an occasional screw under the paper and cardboard, which was originally laid to protect the floor. All it did was serve to say “No need to clean up! There’s cardboard to make it all disappear!” I was freaking out about not having control over this issue…..And I have brought my concerns up… Me: “Maybe we should reschedule the carpeting, considering there is still concrete to be poured in the laundry upstairs, and closets to be trimmed?” Them: “Ah, it will be fine!” but it hasn’t really made a difference. Oh well. 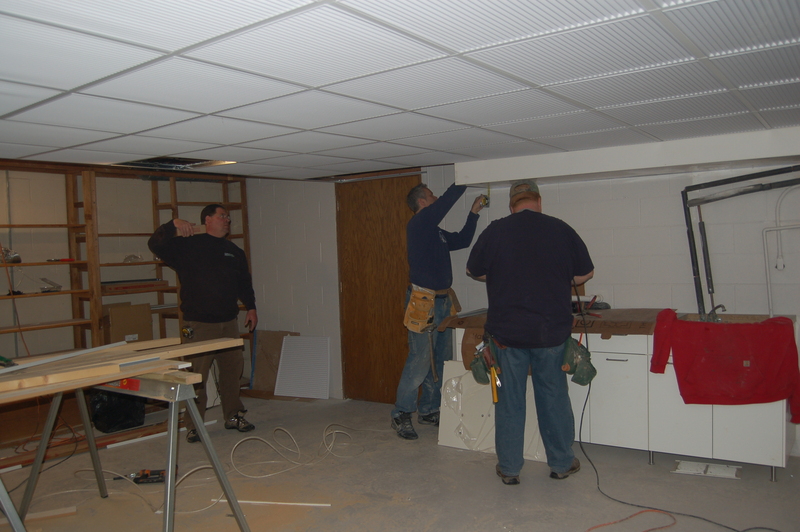 It’s hard, because the guys working on our place are so nice, and, you know, it’s hard to keep complaining! I was at the house “working” most of today, but the real reason I was there was to make darn sure no one was wearing their dirty work boots upstairs! Yes, the carpet survived, but there sure are a lot of dirty finger prints on my fresh-painted doors! It’s a battle I won’t win, and anyway, once my four kids arrive, the house will be anything but pristine! Hand-wipe anyone?? My father-in law Dale transformed our upstairs bath vanities with a bit of wood filler and paint. I will most definitely post “before and after” photos, but I haven’t gotten to the wall paint yet….Look for these in next week’s post! LOVE my new carpet upstairs! 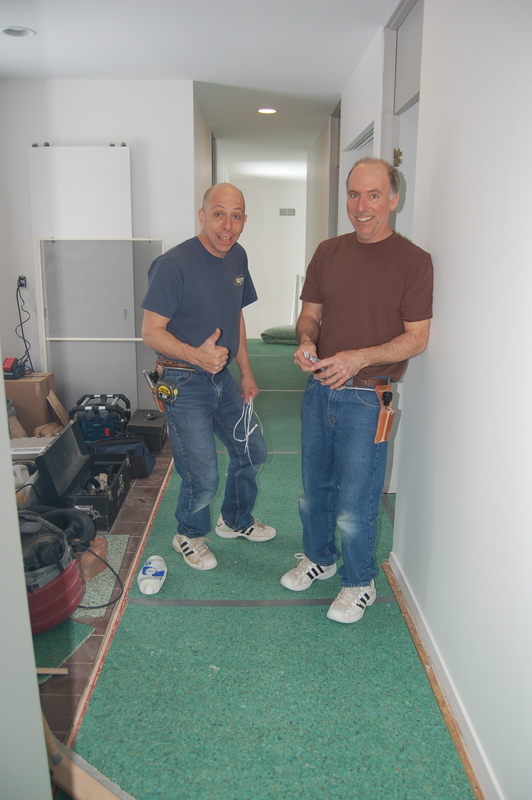 The Berg brothers after laying the green carpet pad. Here’s my carpet! It’s all wool, low-pile. Love it! Despite feeling a little “left in the dust”, I still think very highly of our builder/project manager. He’s a hard-worker, and more importantly, he has remained calm, cool, and collected throughout this process. My hero! 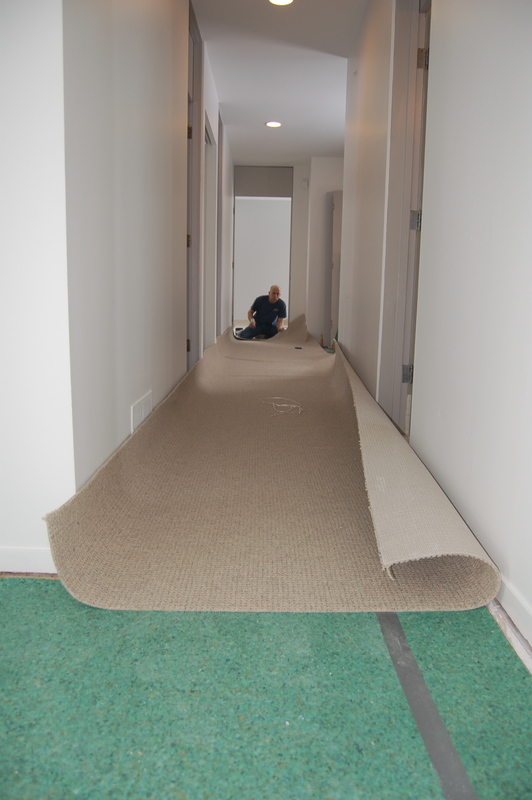 Flooring guy to the rescue! Tom has cleaned the floor (hasta la vista, filthy cardboard! ), and prepares for the final coat he will apply tomorrow. It’s official! The movers are scheduled for 9am, March 16. Hope I have time to touch base with you all before then!